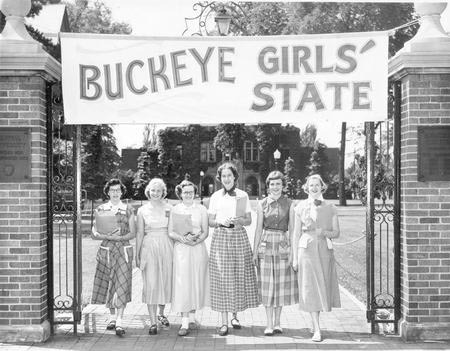 Six participants in the Buckeye Girls' State leadership workshop walking under a banner stretched across gates on the campus of Capital University in Columbus, June 20, 1951. Columbus Citizen-Journal must be cited in any captions or credit lines for this image. Ohio History Connection P 339, AL00106 from the Columbus Citizen-Journal Collection.